Dr. Gillespie recently completed Adaptive Schools training and received official certification to conduct the 4-day seminars. Goals of this training are to assist school districts and organizations in the development of a collective identity. Participants will learn to create an environment where inquiry, collaboration, and positive leadership are the norm. Strategies for keeping group members on track, on topic, energized and resourceful. Dr. Gillespie is currently booking Adaptive Schools Seminars for the 2018-2019 school year, and is excited to bring this work to schools in the future. Demographics of students and families are rapidly changing across the United States. Simultaneously, infrastructure and financing of Educational Service Agencies are often in flux. Diversity in clientele served, & in business and office operations, demands steadfast leadership that is nimble and responsive. Join the AESA Visible Leadership Affinity Group and reap the benefits of collective AESA experience and intellect. Participants are empowered as they lead teams in the design & delivery of innovative solutions. Visible Leadership Forum (threaded discussion board - A place to share ideas or upload articles/think pieces, etc. Virtual Meetings/Webinars - Each meeting addresses critical topics that emerge from within the group as well as access to archived recordings of all meetings. Twitter/Social Media Connections - A shared hashtag connects members with information and tweets dedicated to Visible Leadership. #AESAVisibleLeaders. 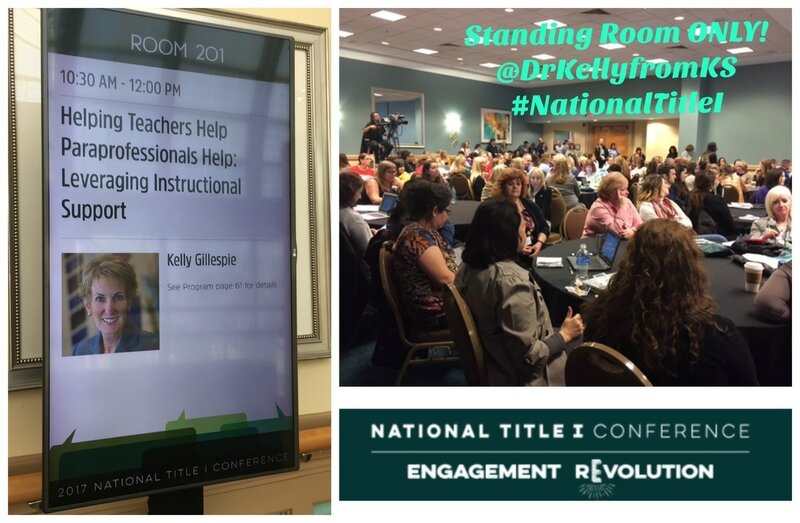 February 23, 2017, Long Beach, CA - Dr. Kelly Gillespie addressed teachers and administrators from across the country this afternoon at the highly-regarded professional learning event. To the delight of those in attendance, this year the National Title I Conference was held in Long Beach, California. Kelly is passionate about supporting teachers and a champion of 'students come first!'. Observe her for a day and you will discover a professional filled with energy and dedicated to innovative solutions. Today, Kelly spoke regarding an often under-recognized educator group--paraprofessionals. She offered strategies for supporting professionals and "helping teachers help paraprofessionals help!" Representing the great state of Kansas, Kelly is making a difference in the quality of teaching being delivered through the nation. In addition to schools and universities, Dr. Gillespie is available to speak to your business or professional organization and can offer leadership training and infrastructure solutions to enhance the effectiveness of your team. 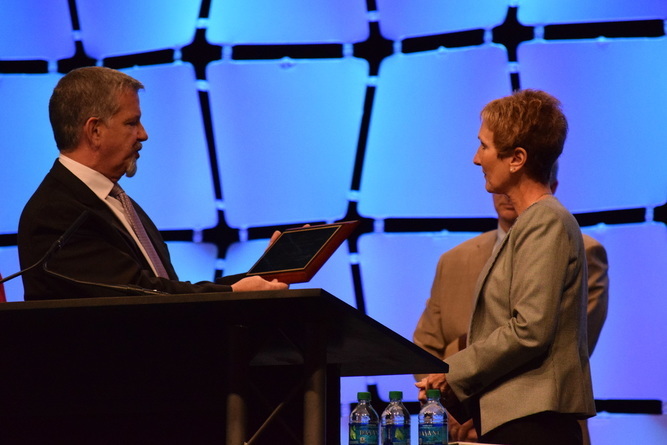 CEO, Dr. Kelly Gillespie, receives national award for Digital eWalkThrough® System. Dr. Kelly Gillespie, CEO of Southwest Plains Regional Service Center in Sublette, Kansas has been named the recipient of the E. Robert Stephens Award from the Association of Educational Service Agencies (AESA) for her design of the Digital eWalkThrough® System. The award was presented on Thursday, December 1, 2016 at the AESA Annual Conference in Savannah, GA. The E. Robert Stephens Award seeks to recognize an individual with a track record of “designing, creating, and amplifying access to a regional system of education through research.” The work at Southwest Plains surrounding the Digital eWalkThrough® System is the centerfold of Kelly’s portfolio. Additionally, the release of her latest book, “#eWalkThrough: Digital System for Instructional Leaders” has had a huge impact in the field as districts and schools implement the process. The eWalkThrough® is a web-based observation tool used for coaching and mentoring. It is accessible via a tablet or phone. The eWalkThrough® is currently being utilized by PK-12 schools, colleges and universities, and its application is beginning to enter the private sector market. Recognition of the quality, innovation, and solution-focused service delivered by Southwest Plains is spreading throughout the country. February 14, 2017 - Dr. Kelly Gillespie was recently asked to present at the Kansas State Board of Education Meeting regarding her recent win of the E. Robert Stephen's award from AESA. November 30. 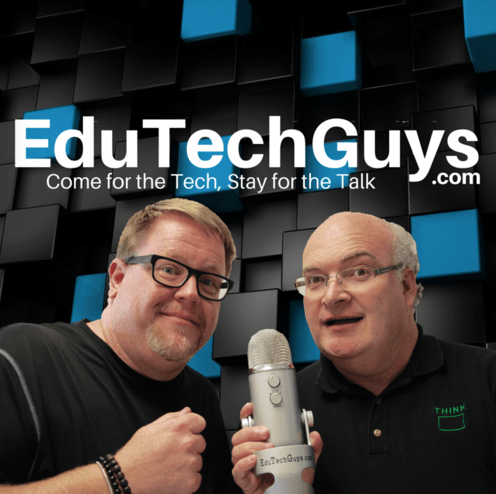 2016 - Listen to the interview from EduTechGuys that took place during the 2016 AESA Annual Conference in Savannah, GA to learn more about the eWalkThrough® classroom observation system and Kelly's research that garnered her the highly-acclaimed E. Robert Stephens Award. December 1, 2016 Savannah, GA - CEO, Dr. Kelly Gillespie, receives national award for Digital eWalkThrough® System. ​The E. Robert Stephens Award seeks to recognize an individual with a track record of “designing, creating, and amplifying access to a regional system of education through research.” The work at Southwest Plains surrounding the Digital eWalkThrough® System is the centerfold of Kelly’s portfolio. Additionally, the release of her latest book, “#eWalkThrough: Digital System for Instructional Leaders” has had a huge impact in the field as districts and schools implement the process. On behalf of Southwest Plains Regional Service Center, Dr. Kelly Gillespie has been selected to deliver multiple presentations at the upcoming Association of Educational Service Agencies (AESA) slated for November 30-December 3, 2016 in Savannah, GA. This national organization, AESA, is celebrating 40 years of service to the profession. The conference theme is, “The Future Depends on Their Future.” Kelly is scheduled to present 3 unique sessions in the 4-day schedule which includes leading edge innovations and research from experts throughout the United States. Kelly's latest book is titled, "#eWalkThrough® Digital System for Instructional Leadership." She has established her team as the go-to source for classroom observation, a process that supports teachers and student achievement. Dr. Gillespie conceptualized and built the Digital eWalkThrough® System, used to observe 13,572 teachers in 726 schools (over 150,000 observations and 6.5 million data points) over the last 5 years. Currently serving districts in Kansas and Nebraska, implementation of this tool is expanding throughout the country. What is excellent teaching? What does excellent teaching look like? What are the behaviors that excellent teachers exhibit to enhance student success? In her new book #eWalkThrough® Digital System for Instructional Support, Dr. Kelly Gillespie describes the details to effectively support teachers where expectations meet practice - in the classroom. With 30 years of combined experience as a teacher, administrator, consultant, and now chief executive officer, Kelly is relentless in her mission that "students come first". Recognized as an expert in the field of teaching and learning, Dr. Kelly Gillespie, CEO of Southwest Plains Regional Service Center, is a progressive entrepreneur. Southwest Plains serves PK-20 educators with "professional learning...innovative solutions" and is quickly becoming the go-to support for instructional leaders. Dr. Gillespie and her team conceptualized and designed the Digital eWalkThrough® System, used to observe 13,572 teachers in 726 schools (150,000 observations and 6.5 million data points) over the last 5 years. Currently serving districts in Kansas and Nebraska, implementation is expanding throughout the midwest. This group is charged with providing a vision for PK-20 collaboration and accountability to prepare future teachers. Notably, Dr. Gillespie will review the research base surrounding the Digital eWalkThrough® System to support this critical partnership. The team at Southwest Plains conceptualized and built the Digital eWalkThrough® System used to observe 13, 572 teachers in 726 schools (150,000 observations and 6.5 million data points) over the last 5 years. Currently serving higher education and school districts in Kansas and Nebraska, implementation is expanding throughout the Midwest. 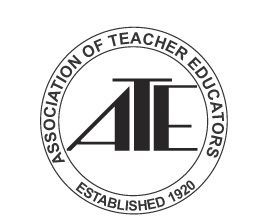 The ATE-Kansas/KACTE Spring Conference will convene on April 1, 2016 at Friends University in Wichita, KS. A full slate of concurrent sessions and presentations is scheduled. Dr. Randy Watson, Commissioner of Education, is also the keynote speaker for the day. January 21, 2016 - Dr. Kelly Gillespie receives top billing as featured story in eSchool News: Daily Tech News and Innovation. 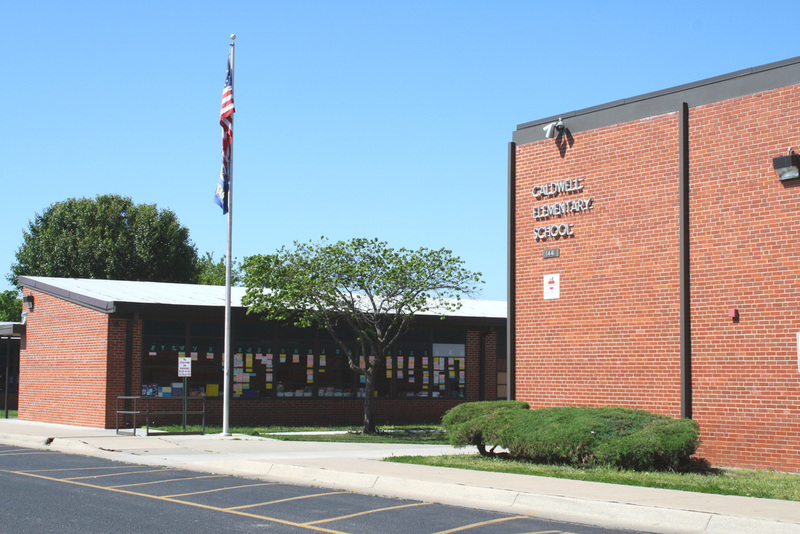 The Digital eWalkThrough System, conceptualized and designed at Southwest Plains Regional Service Center, has captured the attention of innovators in education nationwide. This system is the subject of this month's feature story in eSchool News released today. eSchool News is a monthly publication providing support to K-20 decision-makers for successfully using technology and the internet to transform North America's schools and colleges and for achieving their educational goals. With a readership of more than 500,000 unique visitors each month, eSchool News is a leader in innovation and continuous improvement in education. Providing the latest technology applications to improve learning. Providing tools to assess the funding and purchasing of technology, and to evaluate the implementation of technology in education systems. Assisting educators in forming collaborative alliances and providing a valuable resource bank for the exchange of information, ideas, and best practices. January 2016 - Dr. Gillespie, in collaboration with Janet Jump, recently completed the design of a customized eWalkThrough observation tool for the Wichita School District. The focus of this work in Wichita is on 28 schools within the district that are in the Kansas Learning Network. The Kansas Learning Network (KLN) is the model that the state uses to provide support and technical assistance to schools that are identified as having Priority and Focus status. These schools and districts receive Federal School Improvement assistance, along with the support of the network, to improve student performance and achievement. These Wichita schools will receive customized support for ensuring that instruction is focused on student success and driven by the initiatives and priorities of the Wichita School District. Janet Jump, Title I and Principal on Special Assignment for the Wichita District, is the district administrative lead on the project and the liaison with Southwest Plains Regional Service Center. Disaggregates, analyzes and archives data. Provides instant and continuous feedback. ​The eWalkThrough process is transparent. Clarity generates confidence. Confidence empowers teachers to deliver excellent instruction. Offer high fives to your teachers as they are observed delivering excellent instruction! Model visible leadership as walkthroughs are conducted in classrooms throughout your building and district! Capture priorities for instructional support as the data are analyzed to drive professional learning! Dr. Kelly Gillespie has been selected as a presenter by the National Association of Educational Service Agencies. She will be presenting at the AESA Annual Conference in New Orleans December 2-5, 2015. Are the CCR standards begin taught? Will students be college & career ready? What is happening in classrooms to ensure the future success of students? Powerful data generated by the digital eWalkThrough system provide immediate feedback for decision-making. Because eWalkThrough observation has such potential as a catalyst to support both excellent instruction and a positive shift in learning (WalkThrough as Powerful, n.d.) this process is quickly establishing itself as best practice (Hopkins, 2010). When real-time observation data are collected and analyzed, meaningful self-reflection and collaborative conversation ensues. The final results are clear. The CCR initiative is actualized. Instructional strategies improve. Student success increases. College and career readiness becomes a reality. If you plan to attend this conference, we invite you to select Dr. Gillespie's session and increase your knowledge about how the digital eWalkThrough system can provide support to instructional leaders and generate the data needed for continuous improvement within your organization. October 2015 - Dr. Gillespie was recently called upon to lead the design of a customized eWalkThrough observation tool for the Wichita School District. The focus of this work in Wichita is on 28 schools within the district that are in the Kansas Learning Network. On October 11-13, 2015, Dr. Gillespie will be presenting at the ITEC - Iowa Technical Education Conference in Des Moines, IA. Several hundred teachers and administrators are expected to attend. Kelly will be head and shoulders with national greats including Ramsay Musallam (Ramsey trains nationally with a focus on using technology as a strategic classroom partner in designing learning environments fueled by student curiosity) and Eric Sheninger (renowed keynote speaker and author of Digital Leadership). Dr. Gillespie will be rolling-out the digital resources that have been designed and built at Southwest Plains Regional Service Center. Among these will be 3 increasingly popular instructional systems used in schools and districts throughout the state and region. The eWalkThrough process is transparent. Clarity generates confidence. Confidence empowers teachers to deliver excellent instruction. Flipped Classroom Suitcase - This annual subscription website includes everything an educator needs to successfully FLIP their classroom. With assessment pieces at the end of each of each section, teachers can be assured they are ready to go! For details regarding the conference, or the availability of Dr. Kelly Gillespie to support your conference or district training, contact: Megan Elsey at megan.elsey@swplains.org. 23 - KDGL interviewed Dr. Kelly Gillespie, CEO of Southwest Plains Regional Service Center (SWPRSC), on August 10, 2015. Southwest Plains delivers training and develops resources for schools, districts, institutes of higher education, and even the private sector across the state of Kansas, and now regionally and nationally. "Professional learning...innovative solutions," is our mission, said Dr. Gillespie. "We support member districts and organizations with instructional excellence, which in turn supports student success." As CEO of Southwest Plains, Kelly not only leads the entrepreneurial efforts of her team but she is, herself, an expert in the field. Excellent Teaching: Find your Sweet Spot! Of course, Kelly will serve your group or conference by traveling to the site, but SWPRSC is please to announce the opening of their new Conference Center in Sublette, Kansas. The Conference Center is 8200 square feet, and has the latest technology available for both live and video casting events. Contact Southwest Plains for additional details. For full access to Kelly's Interview visit the KDGH web channel. If you have questions regarding Southwest Plains and would like to book at date with Kelly for your organization, please contact Megan at megan.elsey@swplains.org. Dr. Kelly Gillespie has been selected as a presenter for the National Association of Educational Service Agencies Annual Conference. She will be presenting at the AESA Annual Conference in New Orleans December 2 – 5, 2015. Are CCR standards being taught? Will students be college and career ready? What is happening in classrooms where expectations meet practice? Powerful data generated by electronic classroom WalkThrough provide immediate feedback for decision-making. Because WalkThrough observation has such potential as a catalyst to support both excellent instruction and a positive shift in learning (Walk-Through as Powerful, n.d.), this process is quickly establishing itself as best practice (Hopkins, 2010). When real-time observation data are collected and analyzed, meaningful self-reflection and collaborative conversation ensues. The final results are clear. The CCR initiative is actualized. Instructional strategies improve. Student success increases. If you plan to attend this conference, we invite you to select Dr. Gillespie’s session and increase your knowledge about how the eWalkThrough can support the data needed for continuous improvement within your organization.